Point of use water filters are installed where the water is to be used and only filter the water at that one point. There are several advantages of using this type of filtration. 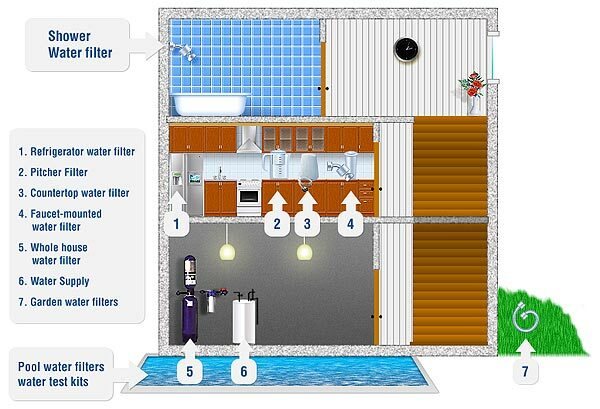 Often you don't have to or simply can't filter all water that comes into your house. The cost of filtering all water can be prohibitively high. You may live in an apartment building and share water line with other people, and so on. Faucet Filters are designed to screw onto a faucet. They generally use an activated carbon or micro-porous filter that traps impurities as water flows from the faucet. Shower water filters are specially designed faucet water filters meant for use on a shower head. Countertop water filters sit on your counter by the sink, and are connected by a hose to your water faucet. Most have a storage tank, and use both an activated carbon filter and a reverse osmosis filter to remove up to 99.9% of the contaminants in your tap water. Some kitchen counter units even include a UV light source to disinfect water. Inline and Undersink water filters are installed ‘in line’ with your plumbing. They may require professional installation by a plumber. Most use a combination of methods including activated carbon filtering, reverse osmosis and ionization to filter water for impurities and soften it. The other option for water filtration – and the best one if your water comes from a well – is a whole house water filter. These are usually installed at the point of entry for your water, and use a combination of filtering systems to remove all possible contaminants from your water. 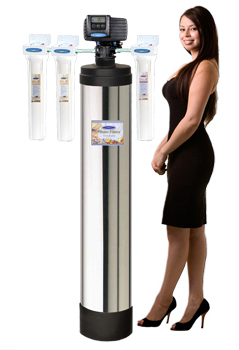 Looking for a Top of the line System for Drinking Water in your home? Let us present Eagle 2000A Whole House System. Beauty and Quality in a single package.